Formula One developed a trend for drivers to arrive, then drop back in their second year to a test ride before returning with valuable experience. Sato is one such driver thanks to Honda. Having won a racing scholarship at Suzuka, he headed to Britain in 1998, shining in Formula Vauxhall and then in Formula Three in 2000 before beating Anthony Davidson to the 2001 title with 12 wins. A seat with Jordan was next and this enthusiastic racer sent his home crowd wild with his first points by finishing fifth in Japan. 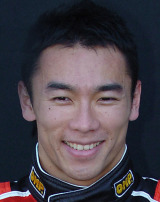 There was no seat free in 2003, so Takuma tested for Honda-supplied BAR team and was promoted in place of Jacques Villeneuve for 2004. While team-mate Jenson Button was almost always on the podium in 2004, Sato managed just one visit, in the USA, but his form fell away through 2005 and he was dropped from the line-up for 2006 and was saved only by the Honda-encouraged formation of Super Aguri Racing. But the team had a constant battle for funding and eventually folded shortly before the Turkish Grand Prix in 2008. Although he tested for Toro Rosso in 2008, he was beaten to the drive by Sebastien Bourdais and after a year on the sidelines he headed to the USA.